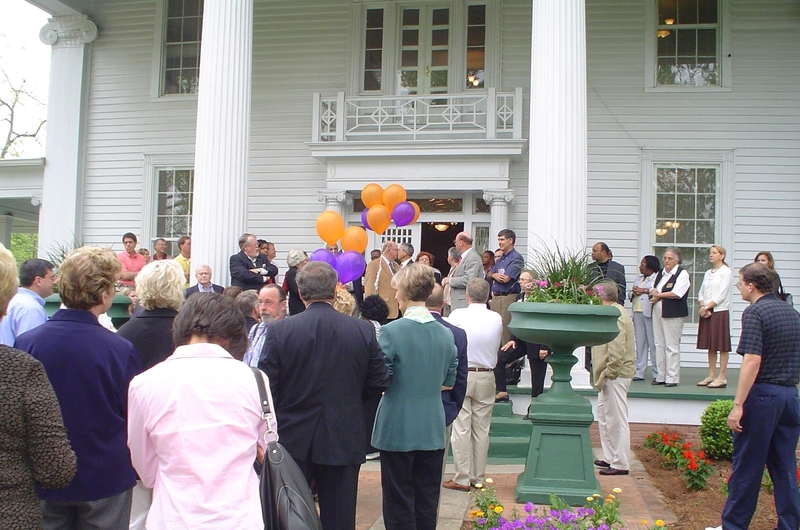 Bus tour participants gather outside the historic Troutman House (circa 1870) in preparation for a walking tour of downtown Fort Valley, Georgia. Located in Peach County, 90 miles south of Atlanta, Fort Valley (population 8,000) has a rich history centered on the county’s namesake fruit. James Abington Everett started the city of Fort Valley when he built a trading post at the junction of two Native American trails in 1825. Everett established a post office in Fort Valley in 1834, and used his influence to bring the railroad to town as well. The rail line between Macon and Fort Valley was completed in 1851, leading to development in the area. The city received its charter in 1856. The meaning behind the name “Fort Valley” is unclear, as the city was never host to a fort. Peaches became a major industry in Fort Valley in the late 19th century. Peaches were first planted in Georgia in the 18th century, but the delicate and perishable nature of the fruit was not conducive to shipping. New refrigerated railcars, as well as the development of a sturdier fruit, made shipping possible beginning in the 1850s, and thanks to its railway connection, Fort Valley became the center of Georgia’s peach industry. By 1921, one third of the peaches shipped from Georgia were from Fort Valley. Today, more than half of Georgia’s peaches come from Peach County, and several fourth generation farmers operate area peach farms. Agriculture is an important part of Fort Valley’s history but is no longer the dominant sector of the economy. The Blue Bird Corporation, founded in Fort Valley in 1927, manufactures school buses and today is the largest employer in the area. Another major employer is Fort Valley State University, a historically black college founded as a land grant institution in 1895. Visitors to Fort Valley during peach season (May-August) can tour orchards and the main peach packing plants in Fort Valley. Another destination is the Massee Lane Gardens, home to one of the world’s finest collections of camellias and the headquarters of the American Camellia Society. An annual Festival of Camellias is held in February, when the flowers are at their peak, but a variety of other plants bloom in the gardens year-round. The annual Georgia Peach Festival, held each June, celebrates the fruit industry that has been so important to Fort Valley. First held in the 1920s, it was discontinued for a time but revived in 1986. The weeklong festival brings 7,000 to 15,000 visitors to Peach County. It features arts and crafts, concerts, games, a parade, fireworks, and “the world’s largest peach cobbler,” made from 75 gallons of peaches and baked in a pan made out of the side panels of a Blue Bird bus. Fort Valley’s Austin Performing Arts and Conference Center began as a single-story dry-goods store. In 1916, the building was remodeled, and a second floor theater was added where plays were staged and movies shown. In 1925 the building served as Peach County’s first courthouse, but by 1934, it had become a movie house once again, and remained so until the 1960s. Remodeled yet again to serve as a discount department store, the building held several businesses over the years before it became vacant in 1996. In 1999 the building was donated to the Downtown Development Authority in the hope that it would be rehabilitated for use as a cultural and commercial venue. In 2004 the Peach County Commission and county voters allotted $500,000 for the theater’s renovation, and the Fort Valley Utility Commission gave a grant of $150,000. The historic building has been in use since January 2007 as a performing arts and conference center run by the Fort Valley Arts Alliance.